A 76-year-old-woman and 79-year-old man from Chicago who'd been missing for three weeks were found. At home. Buried alive in under heaps of crap. 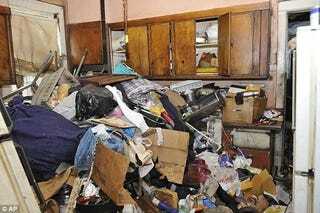 A police spokesman described the couple as "hoarders." Ever worry it could be you? Sometimes, it's just so hard to throw things away. Once when my mother called me a pack rat, I explained that I was actually an archivist. Fulfilling the desire to acquire is an American past-time; our TVs, magazines and roads are filled with commercials, ads and billboards. We're a consumer culture, yet we love to gawk when it goes too far: Hence the shows, from Lifestyles Of The Rich & Famous to Hoarders, Clean House and Hoarding: Buried Alive. Fire crews had to don special haz-chem protective clothing before breaking down the door of the flat on Monday night. They were hit with the unbelievable smell, piles of rotting food waste, and trash. A commenter on this Daily Mail article suggests that the couple were suffering from Diogenes syndrome, which seems quite possible, but the crux of the matter is this: In a society riddled with disposable clothing, furniture and electronics — where we value those who have the newest/latest/best/most things — don't we all relate to those who take it to extremes?